I’m going to get real with you today. THIS is my pantry. I’m not proud of the disorganized chaos, but that’s not the issue today. 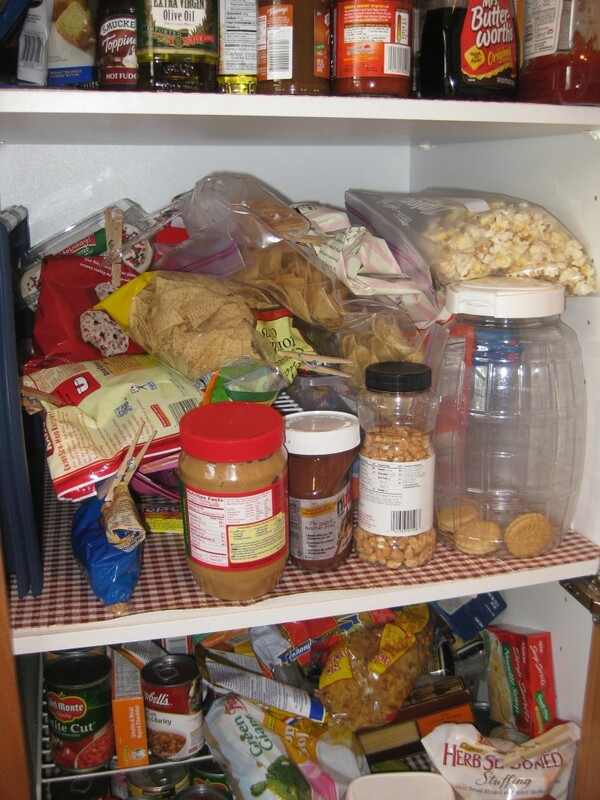 My pantry is OVERFLOWING! My guess is that yours is too. Kevin and I were shopping with the kids at Costco a few weeks ago and he asked me if we needed syrup. We both sat there scratching our heads for several minutes trying to remember if we’d seen the syrup in the pantry lately – the pantry we open and shut a hundred times a day. That’s when it really hit us how BLESSED we are! Or dare I say, SPOILED? We have SO MUCH that we don’t even know what we have! My guess is, you could say the same thing too. Last summer I passed a man standing on the off-ramp of our local freeway holding a cardboard sign asking for HELP. Or should I say…I passed HIM by? That’s the more honest answer. As the “down-turned” economy persists, the level of need continues to grow, even here in the “Orange County Bubble”. My kids are old enough now to ask questions. As parents, Kevin and I have been unsure how to handle their questions. Like you, we’ve struggled between wanting to help, not knowing how to help, and, if we are honest, even doubting at times whether the help is really needed or if the help received will be put to good use or used to fund a bad habit. But God put an idea on my heart that day last summer. 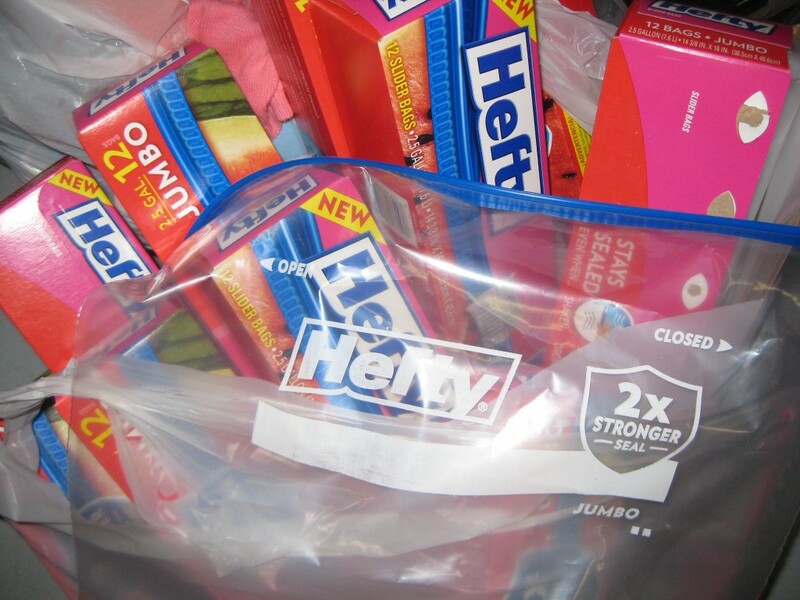 Why not put together a ziploc bag of essential items to keep in my car, ready to bless those in need? It’s not hard to roll down my window and hand off a care package with a smile and “God bless you!” It provides needed items without the risk of giving cash. And even better, by including a Bible and small Bible tract in the package, it offers the hurting both physical comfort and hope for their souls. So this idea had been rattling around in my brain for a few days and as I began to look into it, I realized it would be more cost efficient to purchase items for the bags in bulk. I realized that by including friends and family in the project, we could purchase supplies for a number of bags, then make a day of it – including husbands and kids – and assemble a bunch of bags at once. The busyness of life took over and I didn’t get anything organized for summer but decided to keep the idea in mind for a family Christmas project. The last couple of years we’ve tried to do some sort of Christmas project to help us focus our hearts on the giving rather than the receiving – serving the needy around us would certainly do that! What began as an email sent out to close family and friends, within 48 hours became a nationwide opportunity to BLESS! The Lord has broadened our territory to include plans to distribute Blessing Bags on Skid Row in Los Angeles and among the hardest hit areas of Hurricane Sandy’s devastation. The response has been overwhelming, so we now invite you to PRAY and see if the Lord might be calling you to BE A BLESSING with us! And we’d love for you to join us in this adventure! 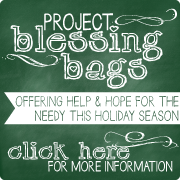 For more information on how you can participate in Project Blessing Bags, click on the button below. It will link you to a page where you can order Blessing Bags to distribute in your area, make a donation to sponsor the distribution of bags here or in other places where they are needed, and/or sign-up to be a part of the assembly team if you are local to southern California. Together, we can be a BIG blessing! But hurry…the deadline for contributing to Project Blessing Bags for 2012 is FRIDAY, DECEMBER 14th! Let us know your thoughts! How can God use you and your family to meet the physical and spiritual needs of those around you?